On Friday, I received a new knitting gadget in the mail. No, that’s not true, really. The item I received is actually quite old, and best as I can tell, never used, or only very gently used. 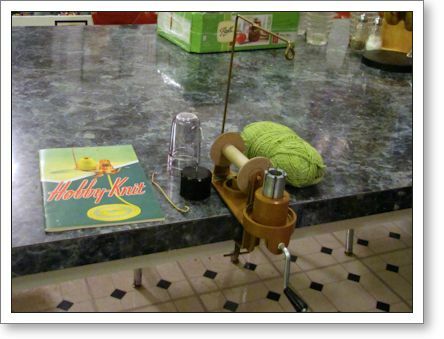 It is a Hobby-Knit I-cord machine, and it was manufactured in about 1949. Somehow a knitting vendor received some remaining new old stock of this device, and I’ve been eying it for a while. I don’t know why, but I-cord fascinates me, and I have collected all sorts of devices for making knitted cord for years. 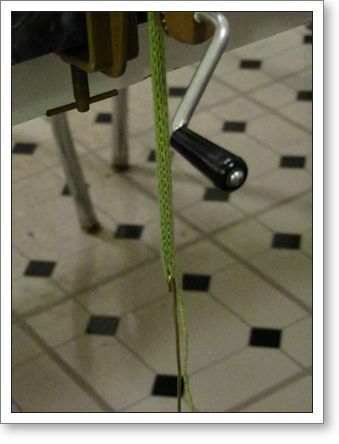 Yes, I know that I-cord can be made with knitting needles, by hand. 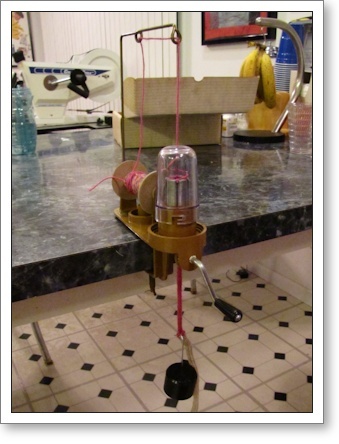 But I love the cranky machines, antique spools, and all sorts of gadgets that have been created with the idea of making a simple knitted tube. And here it is, all set up and ready for knitting. Here’s a closeup of the original label on the machine… it looks like new! The label says, “Hobby-Knit, Pat. App. 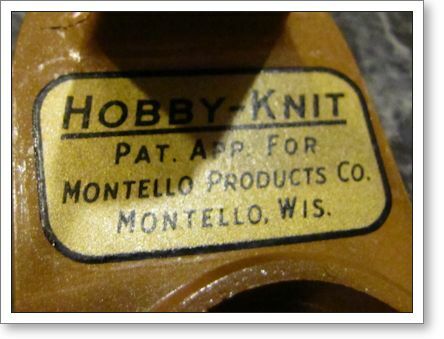 for Montello Products Co., Montello, Wis.” Even the abbreviation conventions are suggestive of its age. My friend Rachel and I made a short video of the machine in action. Check it out; it actually works! The resulting cord is a finely knit 6-stitch beauty, which I think would be the perfect size for jewelry making and other things requiring a not-too-thick cord. Isn’t it lovely? The truth for me is that I’m not sure how often I will use this machine. I’m betting I will use it for some jewelry making from time to time, but so far I find the machine fussy to set up and work with. I’m sure I’ll get better with practice, but there are other machines I have that I also enjoy but are a bit easier for me. That said, there’s something magical about this little beauty. It gives me a feeling of nostalgia to use it. I wonder how many people in the past actually might have had one of these and what they made with it. I’m thrilled that this machine is part of my collection. It makes beautiful cords, and makes me feel like I have something special. I bought one of those too. I am thinking of getting another one becasue I am using only four needles with the one I have. I knit I-cord for my diaper covers. It is a real hassle to change the needles when I want to do a six stitch cord.so am thinking maybe another one?? 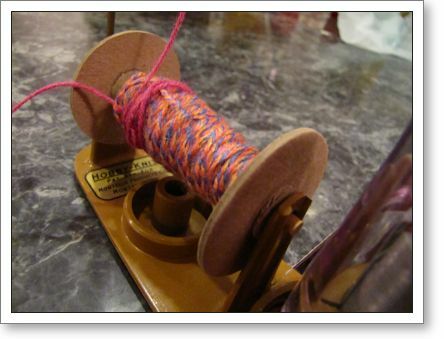 I found your blog because I bought a Hobby Knit on eBay and wanted to see what was out there on the web about this little gadget. Mine was used but in decent working condition; I got a tube going on my first try. I was using two ply sport weight yarn that I had spun commercially from my own and other local sheep, and it was wound in a cake (I have the same Stauch winder that you have). I did not add additional tension as you did; based on a comparison of your photo and what I produced, I think that my method produced a tighter, smaller diameter tube than yours. I also tried two strands of the same yarn: a very very solid tube. I couldn’t find information in the accompanying directions about how to END your tube; do you have any advice? I simply cut the strand and continued knitting; next time I think I need to leave a longer tail but I’m wondering if there’s an easy method for finishing it off. What an excellent tutorial, thanks Trish. You’ve inspired me to look for one on ebay. I found one of these at a tag sale, but no directions. Still can’t figure out how to start. But, on Friday, October 26, 2012, there was an article with (Hand knitting) directions for a “Loopy I-Cord Necklace” in The Detroit News written by Jocelynn Brown. I was able to go on their website and get directions. It’s real cute. I have a hobby-knit machine and I love it. 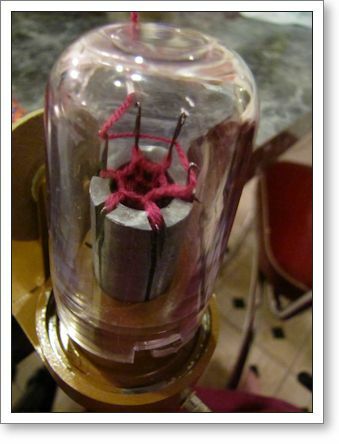 I just purchased a use machine on ebay it knits well. I’m so happy that I fiinally found one. Trish I would love to have one of these hobby knitter machines…I’ve been looking for some time now. Have you heard of any available. I’m looking, looking, looking. Where can we get replacement needles? Hello, Trish I also have the same machine and need some new needles. Do you know where I might get them.? Unfortunately I do not know of a current resource.